Did you know that the Royle PTO raises thousands of dollars each year when you use your Stop and Shop reward card when you shop? 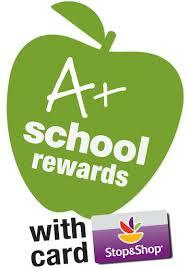 This does not cost you any money… and every time you shop, our school earns cash rewards! Please take a minute to register your Stop and Shop card here, Click Here To Register Your Card. Please enter our school ID# 07719. Your account will then be linked to Royle. We encourage you to give our number to your friends and family, so that they can earn rewards for our school too! Clipped Box Tops are each worth 10¢ for the school and can be found on many products like: Hefty ziploc bags, cereals, frozen items, cleaning products, etc. Here is a complete list of products with eligible Box Tops Click Here for Box Top Product Lists. Please be aware that Box Tops expire, so please double check the dated noted on the Box Top. Have your kids bring the Box Tops in to school. Your teachers will help collect them. The student AND the class with the most box tops at the end of the year will be receiving a really fun surprise! PLEASE MAKE SURE YOU WRITE YOUR CHILD’S NAME AND TEACHER ON THE BACK OF EACH BOX TOP. AmazonSmile is a simple and automatic way for you to support the Royle PTO every time you shop, at no cost to you. When you shop at smile.amazon.com, you’ll find the exact same products and prices as Amazon.com, with the added bonus that Amazon will donate a portion of the purchase price to our school. To register your account so that Royle receives the donations, please go to smile.amazon.com , and select ROYLE PTO as your charitable organization and then select Royle School PTO Charity to receive the donations from eligible purchases. And don’t forget to reset your bookmark from “Amazon” to “smile.amazon.com “. AmazonSmile is a website operated by Amazon that lets customers enjoy the same wide selection of products, low prices, and convenient shopping features as on Amazon.com. The difference is that when customers shop on AmazonSmile , the AmazonSmile Foundation will donate 0.5% of the price of eligible purchases to the charitable organizations selected by customers. Please visitand support Royle School PTO. For more information about Royle’s Royalty Programs, please contact our Royle program coordinator Kimberly Rose.